The elimination of the registration sticker was evaluated as part of a Penn State research study, which concluded that getting rid of the sticker has no impact on vehicle registration compliance. Even better, it will result in a significant cost savings for taxpayers. 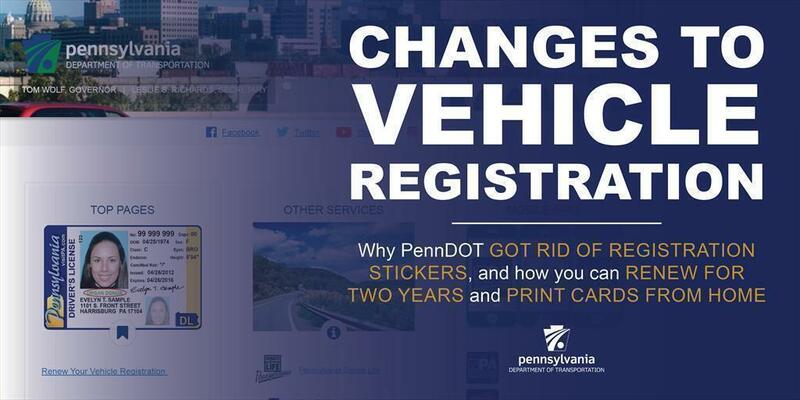 At the same time as the elimination of the registration stickers, PennDOT changed some of its processes regarding registration renewals, allowing customers the option to renew for two years and to print registration cards online. Here are the questions we get asked most often about the elimination of registration stickers and our new renewal processes. How much money will be saved by not issuing registration stickers? Where does the cost savings from no longer issuing stickers go? How will law enforcement know my vehicle is registered? Do I have to remove my old sticker(s)? How does eliminating the registration sticker benefit vehicle owners? How are police in other states going to know I have current registration if I don't have a sticker or my sticker on my license plate is expired? Have other states eliminated registration stickers? Can I cover my old registration sticker with masking material? How do I get a new license plate if I do not want to have a registration sticker on my license plate? How do I renew for two years? Is there an additional cost to renew for two years? What if my county requires the $5 Fee for Local Use and I want to renew for two years? Am I required to renew online and print my own registration card? What if my printer doesn't work, or I don't have access to a printer? HOW MUCH MONEY WILL BE SAVED BY NOT ISSUING THE STICKERS? These cost savings will benefit the Motor License Fund (MLF). The MLF is used to invest in Pennsylvania's infrastructure by repairing roadways and maintaining roads and bridges. Law enforcement agencies have electronic access to PennDOT's database from their patrol vehicles, which allows them to verify if a vehicle registration is valid. In addition, many use license plate reader technology to efficiently validate registrations. The elimination of the registration sticker helps PennDOT modernize our processes. Customers still have all currently available service channels to renew their registration; however, they will also be able to enjoy the convenience of renewing their registration online from home or a mobile device and printing their permanent registration card at the end of their transaction, right from their own computer. With this enhancement to our online registration process, customers will no longer print a temporary registration card nor will they need to wait for the delivery of their permanent card to arrive in the mail. PennDOT has notified other jurisdictions of the elimination of registration stickers. In addition, law enforcement in the U.S and Canada has electronic access to PennDOT's database, which would indicate the registration status of a vehicle. Yes. New Jersey eliminated registration stickers in 2004, Connecticut in 2010, and the Canadian provinces of Quebec in 1992 and Manitoba in 2016. CAN I COVER THE OLD REGISTRATION STICKER WITH MASKING MATERIAL? As of December 31, 2016, you may cover a registration sticker with a masking material such as tape if you wish; however, it is not necessary to cover or remove your registration sticker. You may apply for a standard issue replacement license plate by using Form MV-44 (PDF). A replacement fee of $11 is required and the form must be notarized. Registration renewals can be completed online 24/7 using our online vehicle services page. To log in, you will need your vehicle's title number and plate number. To complete the process, you will also need your insurance information, odometer reading, a valid credit card, and a printer. At the end of the transaction, you will be given the opportunity to print a receipt and a permanent registration credential. PennDOT will no longer mail a registration card for registrations renewed online. When completing the renewal process online, you will be given the option to renew for either one year or two years and the appropriate fees will be calculated. If renewing by mail, simply fill out Section H of Form MV-140 (PDF) with the appropriate two-year fee. A schedule of fees can be found on Form MV-70S (PDF). Note: Not all vehicle types are eligible for two-year registration, including vehicles registered under the International Registration Plan, vehicles with a seasonal registration or circus carnival plate, or those registering with a reduced retired status rate. No, the fee for a two-year registration is simply two times the amount of the registration fee payable for the motor vehicle registration. A schedule of fees can be found on Form MV-70S (PDF). If your county participates in the Fee for Local Use program (PDF) and you opt to renew your registration for two years, you will only pay the one $5 Fee for Local Use. No, if you do not wish to renew online, or you still want to receive a registration card in the mail, you may fill out Form MV-140 (PDF) and mail to PennDOT along with the appropriate fees. Or, when you get your registration renewal notice in the mail, simply fill out the form provided and send back to us. If you completed the online process and were unable to print or save the document as a PDF, please give us a call at 1-800-932-4600. To receive a printed credential in the mail, you will need to fill out Form MV-140 (PDF) and send it to us along with the appropriate fees.